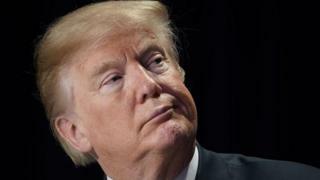 US President Donald Trump don sign budget bill wey congress approve to re-open government after e shutdown overnight. Money wey dem dey use to run government bin finish for midnight because senate no gree to vote on time. Na di military chop money pass for di new budget bill wey Mr Trump sign as dem don approve to increase dia money. Oga Trump bin enter Twitter to talk say dia military go strong well-well now. Di shutdown, wey last reach five hours, na di second time dis year alone under congress wey Republicans dey control.